(c) whether the Government proposes to issue instructions to the banks not to hand over the educational loan accounts to ARCs and to adopt legal methods for recovery of said loans and if so, the details thereof? Model Educational Loan Scheme prepared by the Indian Banks’ Association (IBA) in the year 2001 was circulated to banks for implementation by the Reserve Bank of India in April, 2001. Based on the suggestions from stakeholders and needs of the students, the Model Educational Loan Scheme has already been revised by IBA in August, 2015. Under the revised scheme, repayment period has been extended upto 15 years besides repayment holiday during the course and one year moratorium for repayment after completion of studies in all cases. RBI has issued guidelines which permit banks to engage recovery agents for recovery of all loans. 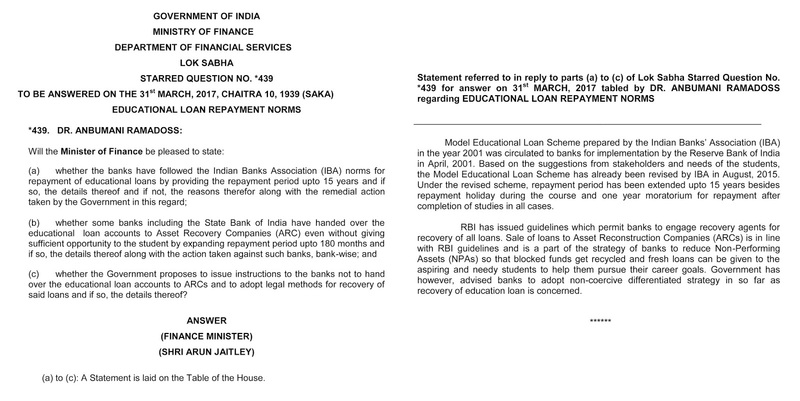 Sale of loans to Asset Reconstruction Companies (ARCs) is in line with RBI guidelines and is a part of the strategy of banks to reduce Non-Performing Assets (NPAs) so that blocked funds get recycled and fresh loans can be given to the aspiring and needy students to help them pursue their career goals. Government has however, advised banks to adopt non-coercive differentiated strategy in so far as recovery of education loan is concerned.